« Is Iowa Doing Everything It Can? As the dialogue on divestment and carbon free economy increases, it is creating an increased risk for assets commonly referred to as “stranded assets”. University of Oxford’s Stranded Assets Programme describes it as “assets that have suffered from unanticipated or premature write-downs, devaluations or conversion to liabilities.” It goes something like this. The international community of climate scientists have warned us that the global temperatures should remain at or below 2 degree Celsius to avoid the irreversible catastrophes of climate change. According to the International Energy Agency’s World Energy Outlook, our current energy consumption may result in an increase of global temperatures to 3.6 degree Celsius. In order to keep the temperatures at or below 2 degree Celsius, we have to leave two-thirds of current fossil fuels on the ground. As climate change leaders and environmental activists increase the pressure on our world leaders, investors, and businesses to subside the use of fossil fuels and switch to clean energy choices, it puts the fossil fuel assets in grave danger of being deemed worthless. Yet, fossil fuel companies continue to increase their carbon-intensive fuel stockpile. Data shows that carbon locked up in coal, oil, and gas reserves owned by the world’s largest fossil fuel companies increased 10% for a total of 555 gig tons of CO2. Because of the growing risks of climate change and a call for carbon-free economy, investments in fossil fuel companies is a bad business decision and a financial risk. The climate change advocates have seized this opportunity which has led to a growing movement of NGOs, students, environmental activists, and others to call on large investors to divest from the carbon-rich investments. What is divestment? 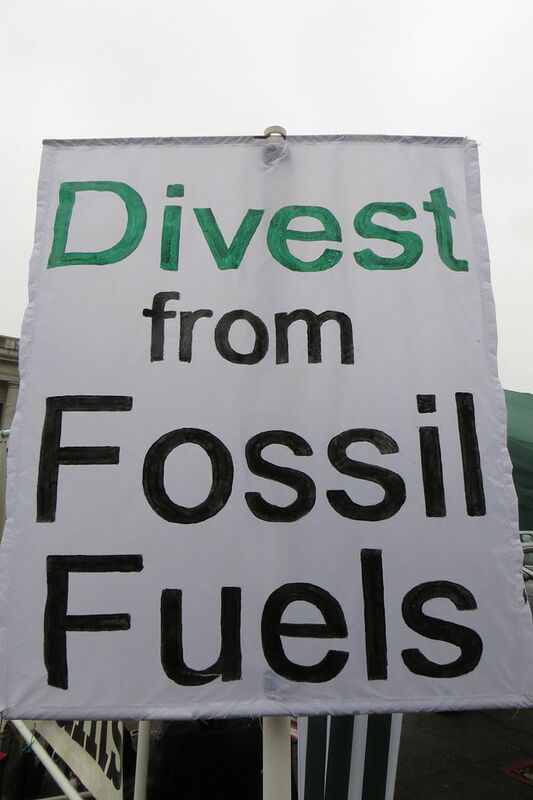 In the fossil fuel industry, the term divestment refers to getting rid of stocks, bonds, or other investment funds that are invested in fossil fuel companies. Divestment minimizes the risks for the investors and at the same time gets us closer to a carbon-free economy. Divestment from fossil fuels is being compared to famous past divestment movements such as tobacco and Apartheid in South Africa. In addition to the environmental argument, it carries with it significant tones of moral argument. Divestment movement has received noteworthy endorsement from high-profile individuals such as UN Secretary-General Ban Ki Moon, Former Archbishop Desmond Tutu, Professor of Economics Paul Krugman, World Bank President Jim Yong Kim, and many others. The divestment movement is getting bigger and more effective day by day. According to Arabella Advisors, 181 institutions and local governments, and 665 individuals representing over $50 billion in assets, have pledged to divest from fossil fuels. These institutions are comprised of universities, faith-based organizations, philanthropies, local governments, and healthcare providers. EY’s Global Corporate Divestment Study also finds that divestments will be a core component of companies’ capital strategy in the next year. This will be driven by investors who will demand improved portfolio performance and shareholder returns. Famous examples of divestments include Stanford University, City of Seattle and City of San Francisco. City of Seattle was the first city to commit to divest from fossil fuel investments. Additionally, foundations such as Ben and Jerry Foundation have committed to divest. A good site to see the pledges and commitments made can be found here. Numerous organizations such as the United Nations (UN), 350.org, Ceres, Inc., Sierra Club, among many others, are calling on investors to understand the risks of carbon-intensive assets and divest from such investments. Divesting, in return, creates opportunities to invest in clean energy technologies. Per Bloomberg Energy Finance, investments in clean energy technologies increased by 16% to $310 billion in 2014. And the EY consulting firm forecasts renewable energy industry will continue to positively perform as technologies become affordable and the appeal of renewable energy increases in emerging markets. You may ask why should you be bothered by this. If you think this does not apply to you, think again. If you have funds invested through an institution, are part of an employee retirement fund, or are a student or a teacher, chances are that you are part of an investment fund that may be invested in fossil-fuel companies. Next time, do a little research on how your funds are invested. And take a moment to question your financial advisors on how your funds are invested. Keep in mind that most business executives are short-sighted in their decisions. Fossil fuel company executives are no different. As some say, these companies are heading towards a cliff with a blindfold on. It is up to you to safeguard your long-term financial assets.